To contact Transpire’s secretary (Chris Corroy), please email transpirebus@gmail.com or write to: 169 Hunloke Avenue, Chesterfield S40 3EA. To contact the organisers of the Peak Park Vintage bus Gathering, please email the Chesterfield 123 group or ring 01246 456776 (evenings only). To contact us about the information on this website, please email transpirebus@gmail.com . Please note that we do not own any vehicles that are available for hire. If you live in the Chesterfield / Sheffield area and would like to hire a vintage bus, please contact the Sheffield Transport Museum who have vehicles that are fully licenced and insured to carry out this type of work. The best way to find the key “bus” points in Chesterfield is to look at this Google map, set at the centre of Chesterfield, showing main bus and coach terminii (B), the Railway Station (T), Rose Hill United Reform Church where TRANSPIRE meetings are held (M) and the Town Hall where most TRANSPIRE trips pick up (P). 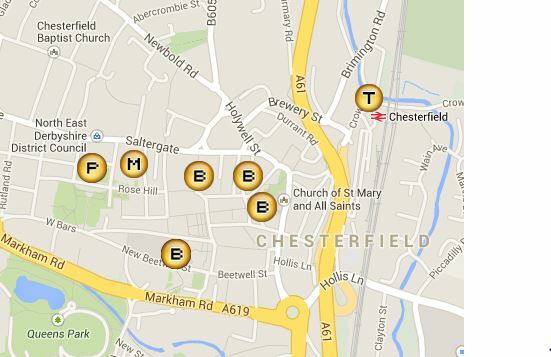 Maps showing the bus routes and bus stops in Chesterfield can also be found on the Derbysbus website here and here.